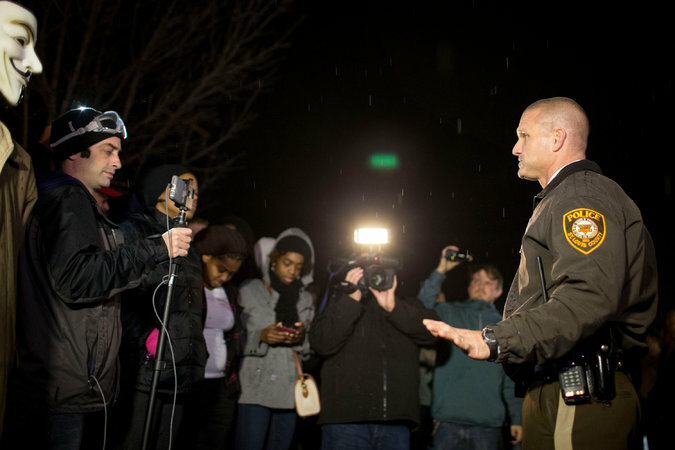 Photo from the New York Times : Lt. Jerry Lohr, who oversees security at the Ferguson police station, on Saturday with protesters, who ask for him by name. Credit Whitney Curtis. As the nation focuses on the events in Ferguson, MO , departments and agencies across the country are working on improving community-law enforcement relations. Through the lens of the Ferguson crisis, we offer these ideas, models, and perspectives for law enforcement. President Obama called for $260 million in response funds to build trust between police and minorities, including purchasing body cameras for officers. Judy Woodruff talks to former New York City Police commissioner Raymond Kelly and Malik Aziz of the National Black Police Association about whether more technology will help prevent another Ferguson-style showdown and what training is most needed. Before, during and after that first night of violence, few law enforcement officials have done more on the ground to ease the volatility of protesters than Lieutenant Lohr, who is white. And few of his white colleagues have been able to connect with the largely black crowds better than he has.